A smiling conman who netted over £100,000 from a holiday scam has been ordered to repay just £1 by the courts after it was found he has no assets. 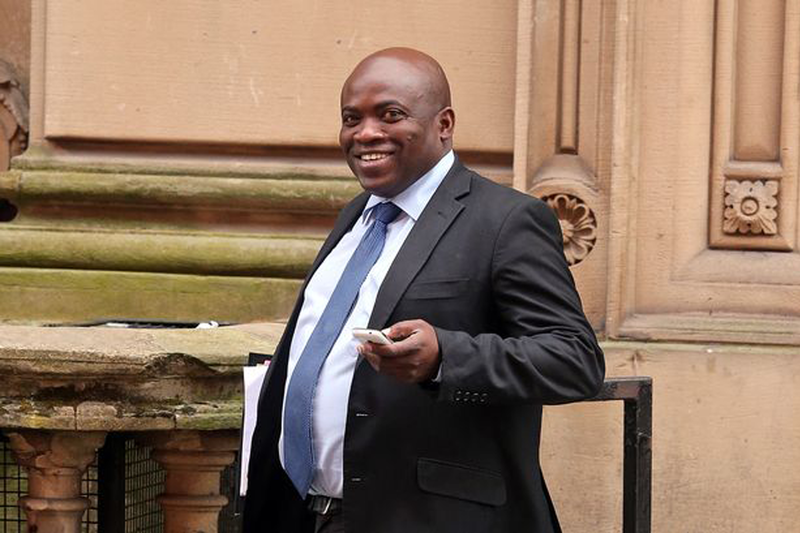 Dean Oliver, 46, who was pictured grinning following a Birmingham Crown Court appearance, was eventually jailed for three years for the con which saw 19 holiday makers ripped off to the tune of £26,000. But after a probe into the Jamaican's assets was told that while Oliver had a criminal lifestyle which raked in £103,649, he had no assets or cash left to seize. With no realistic prospect of recovering more, Ben Mills, prosecuting, said the Crown would ask for a confiscation order of just £1. Mr Mills told His Honour Judge Richard Bond, who jailed Oliver last September, said: "Mr Oliver lived a criminal lifestyle. "The benefit from the offences was £103,649. "He has no assets and therefore a confiscation order is made in the sum of £1." Failure to cough up the cash by March 17 could result in Oliver spending a single extra day behind bars at the end of his sentence. Mr Mills explained while Oliver, from Manchester was convicted of offences against 19 holidaymakers for an amount of £25,993, investigations found a further £103,649 of unexplained deposits in his accounts. Scheming Oliver promised cheap flights firstly from his Smethwick based travel firm and then from Digbeth but he left 19 holidaymakers in the lurch between 2011 and 2012. He set up a frequent flyers club which aimed to attract seven million members. He was arrested after a baying mob descended on his Digbeth office and later convicted of 19 charges of fraud and two of using a false instrument. Jailing him last year, Judge Bond said the scheme was: "at best comical, at worst bare faced lies you told people." "I don't accept for one moment you believed this business model would succeed. "I form the view you are a confidence trickster, taking money from customers knowing full well you wouldn't provide them with tickets. "They were all decent, hard working people who used your services because of promises you made them. "They were easy targets because they wanted tickets to visit family or important occasions such as weddings." "They are decent, loyal people, words that cannot be used to describe yourself."